When it comes to motorcycle clothing, you want a good and comfortable fit as well as a stunning look. From leather to textile, the range of high quality motorcycle clothing available to buy these days is staggering. Don't worry. You won't have to trawl the Internet to find the right items for you and keep getting the sizing wrong. Why? Because everything you need is right here available to purchase from Bike Stop, along with the best advice out there so why not pop into our Stevenage store and enjoy browsing our wide range? We'd love to meet you here and we’ll even offer you a complimentary Lavazza coffee. 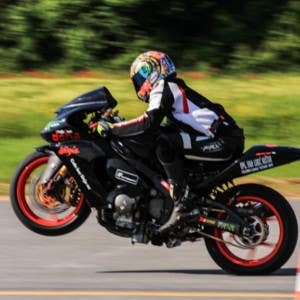 Get geared up, ladies, with motorcycle clothing specifically designed for you, that effortlessly conveys a super-cool look, whilst simultaneously protecting you from the elements or worse!. At Bike Stop, you'll love our showroom dedicated solely to ladies’ gear. Choose from an eclectic selection of textile and leather items, including jackets, trousers, 1-piece and 2-piece suits, Gore-Tex and more. There's something here to suit all tastes and budgets. A biker's jacket doesn't always have to be leather. Some of the most stylish, hardwearing and weather-proof jackets on the market are in fact crafted from high quality textiles, designed and flawlessly made by industry experts. Like our collection of leather motorcycle jackets, most of our textile ones have zips to join with trousers for that extra safety and comfort. 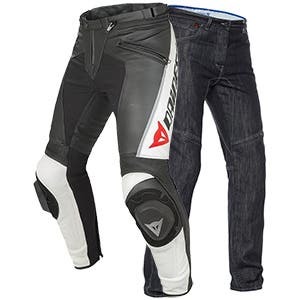 Have you seen our varied selection of leather and textile motorcycle trousers yet? There's something here to suit all style preferences as well as budgets. Simply browse our broad range to find the right pair. Picking up some waterproof over trousers can also be done at Bike Stop, either here at our website or in store. 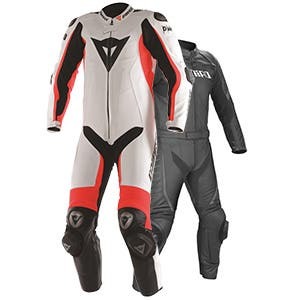 With a one-piece motorcycling suit, your bike won't just look amazing, you will too. A 1-piece suit is the ultimate in race protection, and for bikers who simply ride for recreational reasons or only occasionally, a one-piece all leather get-up can be the perfect way to get into the role of being a true biker. Well, whatever motivates you to get into the saddle, amongst our range we're sure to have a highly protective suit (including the full Dainese airbag range which even includes data logging as standard) that fits your taste and budget perfectly. As above. Like our one-piece suit range, our two-piece suits come in leather or textile. In true Bike Stop tradition, we also draw from several suppliers, to provide you with a massive selection. Don't feel overwhelmed by that, though. If you're feeling spoilt for choice, get in touch or come and see us and we'll help you find the perfect suit amongst our range. Note: We were also the first Dainese dealer to also stock the very latest high-tech Air-Bag equipped suits as worn by riders such as Valentino Rossi and Guy Martin. Like with all our stock, we do our best to always have a complete range to ensure you get the absolute best fit. Look incredible on a bike in a pair of Denim jeans. It's not all about the look, though, of course. The Denims we stock are all sourced from leading suppliers with a reputation for designing and making jeans that are well reinforced using either Kevlar or Aramid fibres – get that essential extra protection you need should you fall or slide. What's more, the internal pockets that come built in allow you to add armour, making you even safer on the road or track. Going biking without gloves is simply madness. Don't do it. Instead, invest in a pair of decent motorcycling gloves, whether you're the one in control of the bike or the pillion rider hanging on tight. We have in stock an extensive assortment of expertly designed gloves designed to protect your hands at all times, whilst simultaneously allowing you to feel in control of your bike (without your fingers feeling too hot or restricted by excessively thick material and rigid stitching). 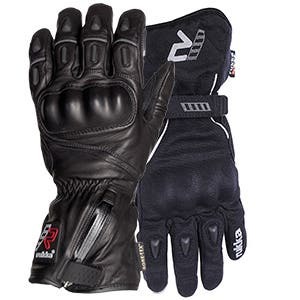 Avoid those potential issues by instead choosing from our impressive array of motorcycling gloves where you'll find hand-wear for all seasons and every type of biking. When it comes to biking gear, it's usually boots that start to look tired and worn first, isn't it? To stay in control of your bike, you're using your feet all the time, so it's hardly surprising that you need to replace your footwear every few years. Bike Stop makes it easy and pleasurable for you to do that. How? 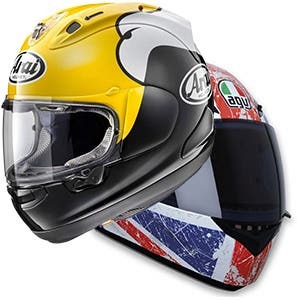 By making available to buy a fine assortment of motorcycling boots sourced from leading suppliers – globally renowned companies that know exactly what bikers want and also what they need: comfort, style, safety and control. 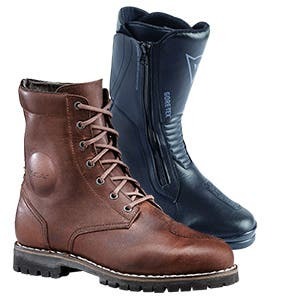 The boots you get from us will be specially designed to go inside your biking trousers, and, as well as being wholly waterproof, will be breathable, thanks to Gore-Tex. 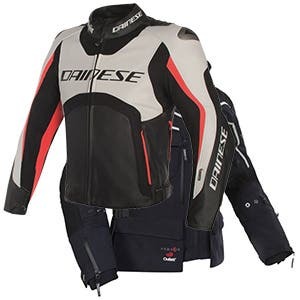 With all our Motorcycling Clothing range, there's a broad selection of sizes and colours, and we also offer adjustments, customisation and full made-to-measure on all Dainese leather products. We also offer repairs so just ask for a quote. Whether you opt for purchasing 'off the peg' or go for something tailor-made, the motorcycling gear you get from Bike Stop will provide you with protection from the elements – make a smart investment in gear that's waterproof, windproof, vented or thermal layered. 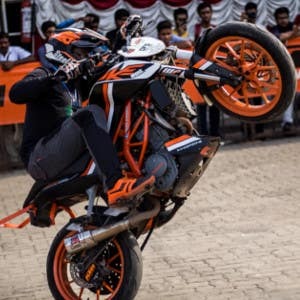 Feel safe whilst looking good at the same time in clothing that won't fall apart, and can be reinforced with motorcycle body armour, to give you even more confidence whenever you go riding.